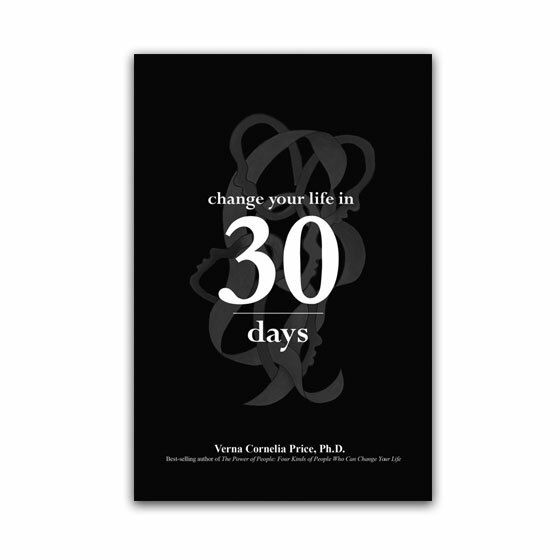 Change Your Life in 30 Days, Dr. Verna’s most recent book is a day-by-day, step-by-step approach to creating successful changes in your life. Any change you want to make in your life, whether it applies to time management, diet and exercise, work or home life, can be made by reading no more than three pages a day. Change Your Life in 30 Days, Dr. Verna’s most recent book is a day-by-day, step-by-step approach to creating successful changes in your life. Any change you want to make in your life, whether it applies to time management, diet and exercise, work or home life, can be made by reading no more than three pages a day. This book is you daily personal power guide to creating the change you want to see in your life. Dr. Verna’s has created an entire “Change Program” that you can do at your own pace that guarantees you results. It’s very simple, you read the book one day at a time, you do the work at your own pace and you will see the change you desire!